An eight member Indian Buddhist delegation led by Ven. Dr. Bhadant Rahula Bodhi Maha Thera met HE the President Mahinda Rajapakse at the President’s House in Kandy on February 22. The primary purpose of the visit of the Indian delegation was to strengthen ties between the Buddhists of the two countries and bring India and Sri Lanka closer to each other through the historical bond and civilizational link of Buddhism. 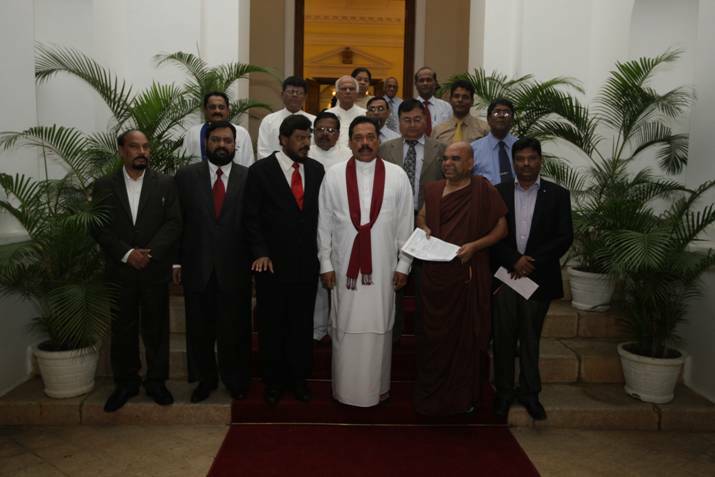 They also canvassed the possibility of the installation of a statue in Colombo in honour of Dr. Babasaheb Ambedkar, the Indian Buddhist savant, who in the wake of the foundation laid by the Anagarika Dharmapala for the revival of Buddhism in India in the late 19th century and the first half of the 20th Century, was instrumental in bringing large numbers of Indians i.e. literally hundreds of thousands of down trodden people (Dalits) into the fold of Buddhism. On the historic day of October 14, 1956 at Deekshabhoomi, Nagpur Dr. Ambedkar publicly converted to Buddhism. He took the three refuges and the Five Precepts from a Burmese Buddhist monk, Bhadant U Chandramani, in the traditional manner, and in his turn administered them to the 600,000 of his followers who were present. The conversion ceremony was attended by Medharthi, his main disciple Bhoj Dev Mudit, and Mahastvir Bodhanand’s Sinhalese Buddhist successor, Bhante Pragyanand. This is considered as perhaps the largest conversion of people from one religion to another at one single place in recorded history. Dr. Ambedkar would pass away less than two months later on the 6th of December 1956, just after finishing his definitive work on Buddhism. Many Indian Buddhists employ the term “Ambedkar(ite) Buddhism” to designate the Buddhist movement, which started with Ambedkar’s conversion. Today, the growing Indian Buddhist population is estimated to be in the vicinity of 70 “”…” 90 million people. In the Lok Sabha ( India’s Parliament in New Delhi) 127 Members of Parliament (MPs) out of a total number of 552 MPs identify themselves as “ƒ”¹…”Ambedkarites’ (followers of Ambedkar) though they are not necessarily all Buddhists. The Indian Buddhist team arrived in Sri Lanka on February 21 at the invitation of Dr. Lilaknath Weerasinghe, President “ƒ”¹…”Success Sri Lanka’ based in Kandy and its membership, which hosted the delegation during their stay in Kandy and Colombo and accompanied them to Anuradhapura in conjunction with the generous assistance provided mainly by the All Ceylon Buddhist Congress and co “”…” ordinated by the German Dharmaduta Society (in association with the Indo “”…” Sri Lanka Buddhist Network), all of which entities constitute Regional Centres of the World Fellowship of Buddhists (WFB). President Bhikkhu Sangha’s United Buddhist Mission, India. 3) Mr. Avinash Kamble, President “”…” United Buddhist Federation, India. 4)Mr. R.L. Tambe,Principal “”…” Tambe Education Society College, Mumbai. 5) Mr. Sachchidanand Fulekar, Principal “”…” Dr. Ambedkar Law College, Nagpur. 6) Mr. Sachin M. Moon, Managing Director, Lord Buddha Television, India. 7)Ven. Bhadant Rewat Bodhi, High Priest, Bhikkhu Niwas Gedam layout, Nagpur, India. During the course of their visit the Indian Buddhist delegation met the Maha Nayaka Theros of the Malwatta and Asgiriya Chapters, Ven. Banagala Upatissa Nayaka Thera, President, Maha Bodhi Society, Ven. Kirama Wimalajothi Maha Thera (President, Buddhist Cultural Centre), Ven. Dr. W. Wimalagnana Thera (Gangaramaya, Peliyagoda), Ven. Medagama Dhammananda (Asgiriya Maha Viharaya), Ven. Getamande Gunananda Thera, Ven. T. Palitha (Nalandaramaya, Nugegoda), Ven. Mettavihari and Ven. Galayaye Piyadassi Thero ( Chief Sanghanayake Thero of the United Kingdom currently on a visit to Sri Lanka), among others. At a public talk delivered by Ven. Dr. Bhadant Rahula Bodhi Maha Thera on the topic “ƒ”¹…” The Revival of Buddhism in India’ on March 1, at the Maha Bodhi Society, Colombo, Ven. Banagala Upatissa Nayaka Thera made a public announcement that a suitable portion of land within the boundaries of the Maha Bodhi Society precincts at Maradana, Colombo 10 would be allocated for the installation of the first statue of Dr. Babasaheb Ambedkar (in Sri Lanka) and in close proximity to the pre-existing statue of Angarika Dharmapala, founder of the Maha Bodhi Society. A significant proposal made by Ven .Kirama Wimalajothi Thera for the establishment of an Institute under the name of, say, “ƒ”¹…”Dr. Babasaheb Ambedkar Indo-Sri Lanka Buddhist Centre’ on a 2 “”…” 5 acre plot of land in extent within a reasonable distance of Colombo is under serious discussion. This proposed Centre will provide residential facilities as well as training opportunities for visiting Indian Buddhist monks and nuns, both strictly separated in different buildings. There will be a Board of Management to plan and administer the premises and the Dhamma teachings. The establishment of a corresponding Centre in India in either Nagpur or Mumbai has also been suggested. The convening of an International Conference on the topic “ƒ”¹…” The Revival and Renaissance of Buddhism in India in the 20th Century’ has also been mooted. Both India and Sri Lanka share a deep civilisational continuum. The frequency of these interactions through the bond of Buddhism will re- activate our civilisational paradigm, and make people of both countries re- discover the lost sense of our history, geography, and culture, which determined our understanding and relations with each other, and others in our neighbourhood. Lets hope this is not another one of Indias geopolitical games taking advantage of Buddhism to further their parochial agendas in the region. Whenever there is agathering of politicians mentioning so called “common bonds” with India I become skeptical. We dont have any bonds with Indians constantly and obediently licking the boots of the westerner. – before trying to talk of Buddhism, Indians must first apologise for creating and nurturing division and terrorism in Sri Lanka for decades. It must come up within Colombo city. Otherwise these resident Indian Buddhists monks will find it very difficult. It must help SL REVIVE Buddhism in a positive way where it is needed most. Sri Lanka must export a Buddhist anti-caste revolution to India. Very good. They have Religious Freedom in India.. I have read the Biography of Dr. Ambedkar several years ago. They have religious freedom, but the casre system is rigid in India. The core message is Religious Freedom and Religious Discrimination and Religious MYTHS. 1. India is a Secular State. There is some kind of Separation between State and Church. The Hindus and the State did not Prevent Hindus converting to Buddhism. It was not done 2,500 years ago in India, recently in India as well as in Sri Lanka 2,300 years ago when Hindus converted to Buddhism. 2. Conversion from One religion to another is NOT proof,one myth over another myth. 3. Throughout history, the Hindus have been converting, primarily die to the caste discrimination, and the myth associated with the caste system. 4. Follow on Lord Buddhas Enlightened Philosophy, bot based on Bodu Bala Sena Terrorism, that is destroying Buddhism in Sri Lanka. will these indian buddhists come forward and do something. to safeguard sinhala buddhists from hindu and christian tamil terrorism in sri lanka.? Still good to have Indian contacts. – Be wary of unwittingly repeating Indian myths and distortions that politicians have fed us. Whereas early Vijayan Prakrit speaking Singhalar immigrants may have been bonded caste-Hindus, indigenous Yakkas and Nagas also received Buddhism. They were not Hindus. They were not not bonded by caste. Voice 123 is absolutely on the ball, the Indians in whatever disguise cannot be trusted & this may be another ploy to infiltrate Sri Lanka. Our poor monks with little gains in return are going to sacrifice land from the heartland for the Indians; if they come for true Buddhist reasons why is their first proposal is to have some land & indian statues? We need to educate our ignorant leaders of the dangers of this association. THE PEOPLE IN THIS ISLAND BEFORE MAHINDAGAMANAYA WERE”” SEMI VEDIC” BUDDHISM ORIGINATED IN A SEMI VEDIC SOCIETY. EVEN 300-400YEARS BEFORE VIJAYA AND HIS PEOPLE CAME SEMI VEDIC PEOPLE HAVE BEEN HERE. THEY WERE NOT HINDUS. LATER THE VEDIC RELIGOIN WAS TRANSFORMED IN TO HINDUISM. YAKKHA ,, NAGA AND DEVA ETC MIXED UP WITH THESE SEMI VEDIC PEOPLE AND DURING PANDUKHABHAYA TIME THEY BECAME ONE NATION—SINHALA. BADDHA KACHCHAYANA- THE WIFE OF PANDUWASUDEVA WAS A BUDDHIST AND WAS RELATED TO BUDDHA. LORD BUDDHA VISITED 3 TIMES EVEN BEFORE VIJAYA AN MOST OF THE NAGAS BECAME BUDDHISTS . DEVA WANSHIKA SUMANA(sumana saman””) TOO WITH HIS FOLLOWERS BECAME BUDDHISTS. ACCORDING TO SOME CRONICLES “KUVENI WAS DRESSED AS A “thapasika” . AT THAT TIME THERE WERE SOME JAINISTS BUT NOT HINDUS. IT WAS EASY FOR JAINISTS TO UNDERSTAND BUDDHISM RATHER THAN TO HINDUS. Indians (biggest cheaters of the world today) are trying to change history by repeating the mantra ” Hinduism is 100000 years old”. No such thing. If is even younger than Islam. It eveloved from vedic and Braminism. ” THEY WERE NOT HINDUS” – this sums it up. – im not an expert in history or culture but this is my take on the issue. We must be careful how we use terminology like Vedic and semi vedic etc, otherwise it will attract further unwelcome attention from Indian busybodies who think they are the last word on the subject. The Veddahs (who are probably the remnants of Yakka and Naga culture as well as the indigenous in neighbouring areas like Andamans, Niccobar, Laccadives, Burma etc (who they are said to be genetically related to) have not been bonded via Vedic influences. Yakka acceptance of Buddhism did not lead to them becoming caste-bonded. Subsequent settlers from other parts of India seem to have imported the caste system into SL DESPITE the prevalence of Buddhism. The casteist cat has been lurking among the Buddhist pigeons for centuries, waiting to pounce at an opportune moment (NOW!). Sinhalese are the ONLY Buddhist society in the world with a functional caste system. Add that to the Prakrit derived Sinhala language and we are very tied to India. It enables politicians to claim they are our special “relatives” over and above the rest of humanity. (note Buddhism does not place emphasis on racial or relatives connection. Only Hinduism does this). The European colonialist (greedy/oppressive interests from Eurupe) back in the centuries past were less sophisticated in their method of conquest. Today we can see how through tools like the Commonwealth, UN, economic disparities, lopsided education system, INGOs, Italian political spouses, etc, they have “re-conquered” the ruling castes and classes of India, who are now co-opted into oppressing their own masses. This current obsession with human rights, “the last 30 days of a 30 year war”, economic sabotage of Sri Lanka etc, is their way of bringing Sri Lanka back into the “new shadow empire”. (And ultimately the entire third world). Different carrots and different sticks are used for different occasions. The carrots of investment, emigration opportunities and higher education are used to entice Indias ruling brown Sahibs. The stick of Chinese ascendency and their own vanity is used to strike fear into the contemporary Brahmins and B sahibs. They are then co-opted into using the human rights and disinvestment stick to keep us “un-bonded” Sri Lankans in our place low down in their pecking order, exploited and controlled. Thats why we must quickly realise that Asokan days are long long gone. Todays Brahmins are in cahoots with powerful elements of the west and the latter have already signed their own country’s “death warrant”. We must be careful not to fall prey to their machinations. WORST enemies of SL are SL Tamil Homeland Believers. Teaming up with any DEVIL to destroy them is the right thing to do. This entry was posted on Tuesday, March 5th, 2013. You can follow any responses to this entry through the RSS 2.0 feed. You can skip to the end and leave a response.